Why learn to ride or drive at High Hopes? 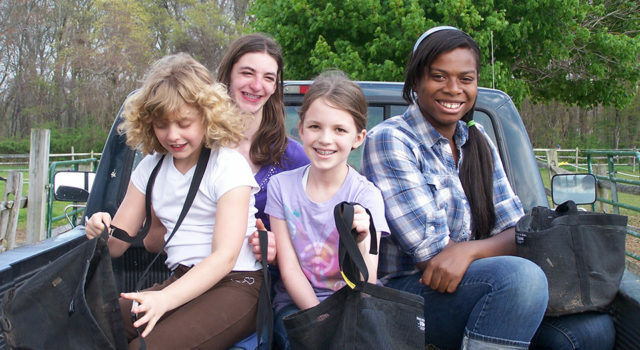 Our program is designed to open up the world of horses to our local community in a safe and fun learning environment. Our horses are specifically chosen for their good nature, patience and willingness to interact with people. Our professional staff has received extensive training on safety and the most effective teaching methods to reach all individuals. Our community lesson programs offer something for all levels of riders from someone who has never ridden to someone who is looking to further their riding and horsemanship skills. Please complete the application form below to inquire about times and availability. Wondering if these programs are for you? High Hopes welcomes community members of all ages and experience levels. To inquire about our community lessons please fill out the form below or contact Rachel Golden at rgolden@highhopestr.org, or (860) 434-1974, ext. 133. The people who come to High Hopes represent all ages & backgrounds.The majority of our participants are between the ages of 3 and 14, some are in their 70’s. Most participants have varying degrees of cognitive, physical, behavioral, psychological or sensory disabilities. The Equine Learning Program curriculum is designed on an individual basis to accommodate each student’s needs and goals. The Equine Learning Program is an excellent way for individuals to develop confidence and become comfortable working with horses. High Hopes has a variety of outreach programs designed to bring equine-related activities to an even larger population of people who can benefit from them throughout the community. Have Questions or Just Want to Say Hey? High Hopes Therapeutic Riding is located at 36 Town Woods Road, Old Lyme, CT.